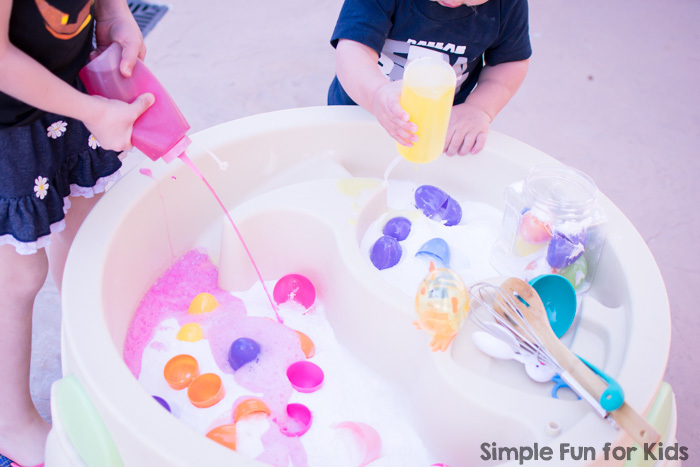 Are you looking for a simple, low-mess sensory activity that’s impressive every time and perfect for kids of all ages, even if you have several kids of different ages who want to play together? 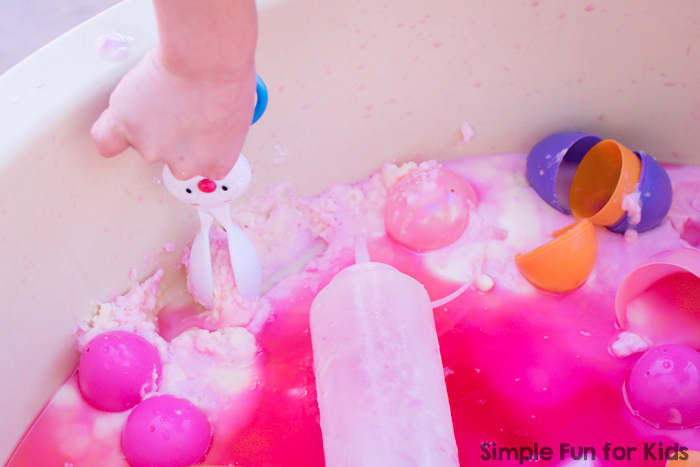 Baking soda and vinegar are go-to materials for that kind of situation. You can add new materials each time, and it truly never gets old. 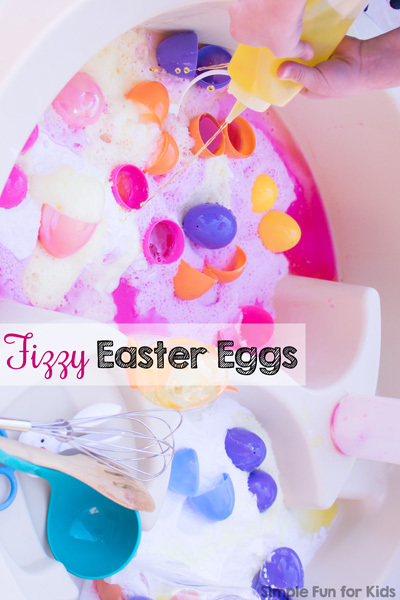 This time, we turned the basic baking soda and vinegar reaction into an Easter-themed activity with Fizzy Easter Eggs! (N was 1 year and 8 months old. 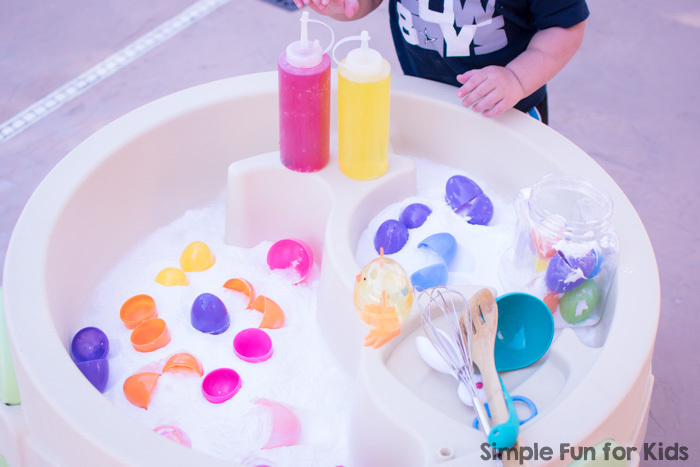 Water table (optional but great for any and all sensory activities, especially when there are several kids playing). Fizzy tub colors or liquid watercolors or food coloring (optional but bright colors are always fun). 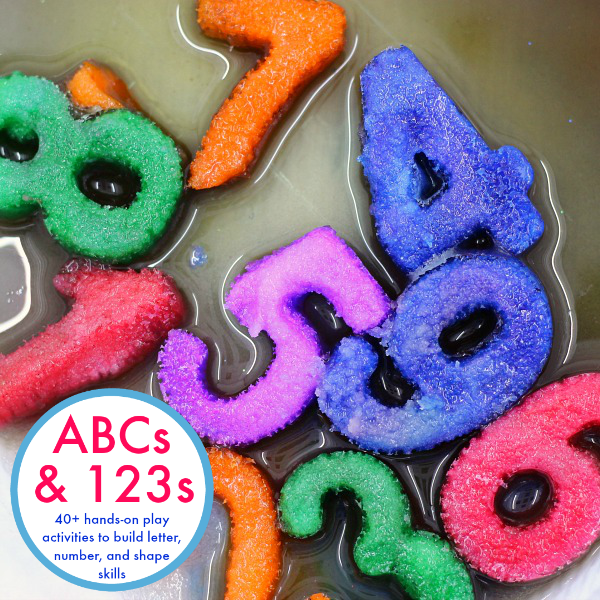 We chose red and yellow fizzy tub colors for this activity. 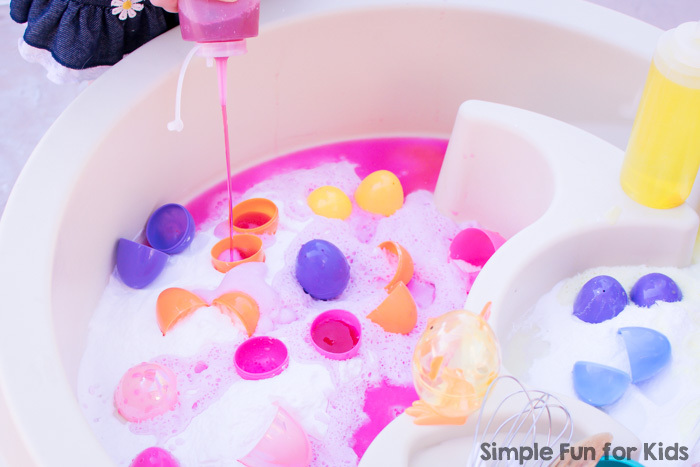 Tub colors are my favorite way of adding color to activities like this because they are BRIGHT while being pretty inexpensive, and you can just throw them into a squeeze bottle of vinegar without needing any extra tools or getting your fingers dirty. 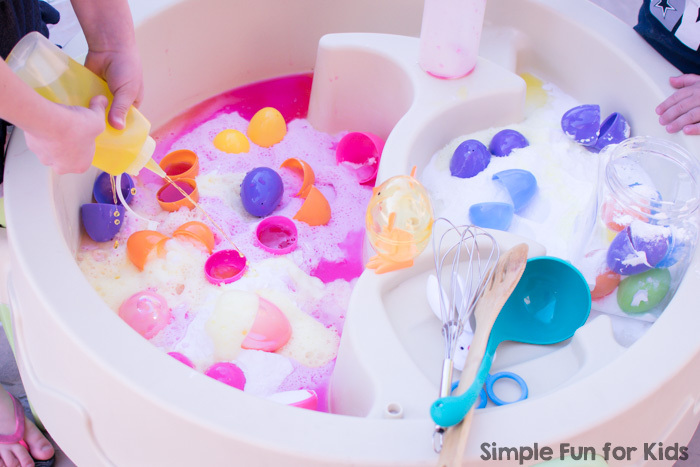 Plus, it’s super easy to mix colors with them, too. Both E and N grabbed a squeeze bottle each right away and started squeezing vinegar on the baking soda. 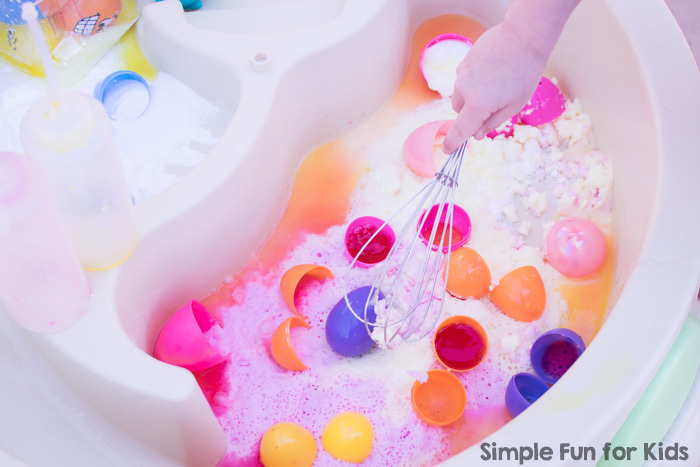 and just flooding everything for maximum fizziness and fun. 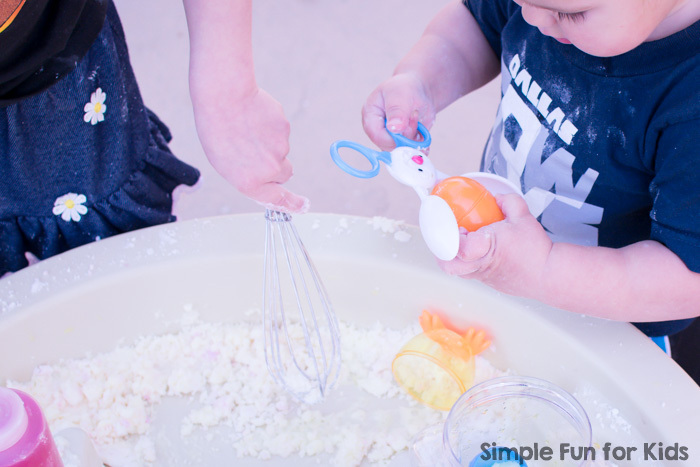 N was more about trying out all of the different kitchen utensils, mostly on dry or barely moist baking soda. 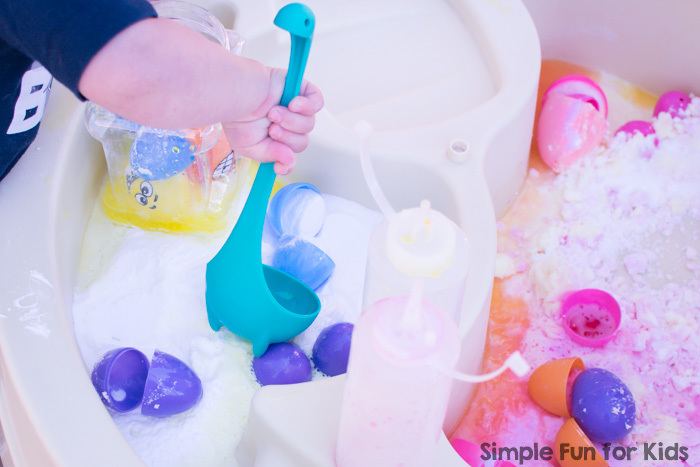 He also checked out the bunny tongs again (that he also used in this Easter Basket Sensory Soup activity) – they work great with the plastic Easter eggs. You definitely don’t NEED a water table, but it’s just so handy to raise the area where the kids play off the ground and provide plenty of space for exploration that we decided to buy another one before moving back to Germany because they’re not as easily available over there.